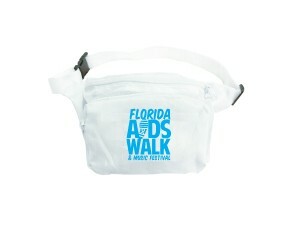 We here at the Florida AIDS Walk & Music Festival HQ love our fundraisers. Without you, we wouldn't be able to make a difference in as many lives of people living in Florida with HIV/AIDS. You give this event purpose! We encourage all participants to raise at least $100. The money you raise supports HIV/AIDS services for our friends and neighbors throughout Florida. Read more about the amazing organizations right here in our community that your fundraising supports. This year, we will have some cool prizes to reward you for meeting certain milestones. Get the T-shirt above plus this trendy Bum Bag to carry your goodies while you’re walking. 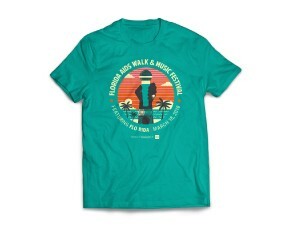 Get the T-shirt, Fanny Pack, and Florida AIDS Walk and Music Festival Flip Flops. 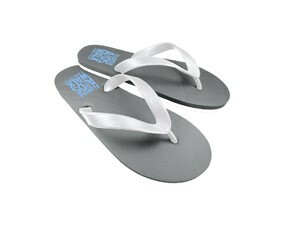 Because what’s better for chillin’ on the beach than some funky flip flops? You’re a Power Walker! 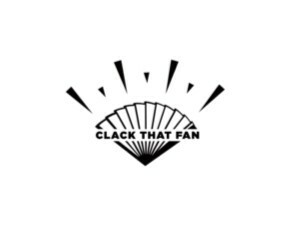 You’ll get all of the above plus a custom fan made specially for the Florida AIDS Walk and Music Festival by the geniuses at Clack that Fan. And you’ll get premier parking plus access to the VIP Deck! You’re a Power Walker PLUS! 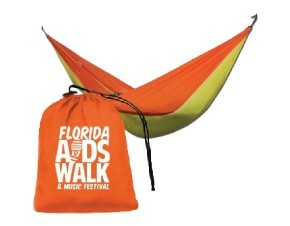 You’ll get all of the benefits of a Power Walker, plus this awesome hammock (you can pick it up after the event so you don’t have to carry it around with you as you’re walking), as well as an invitation and recognition at the AHF VIP Party on March 22nd!. Congratulations to the winner of our Team Challenge, Robin S. of Team Aqua Foundation for Women! 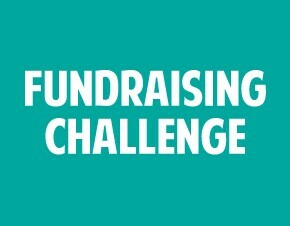 Congratulations to the winner of our Fundraising Challenge, Robin S., who raised $5950 during the challenge period! 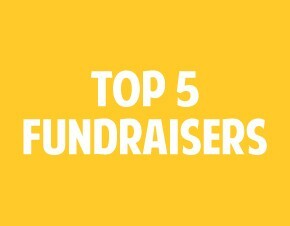 The Top 5 Fundraisers will get all Power Walker Plus benefits, premium parking and Ultimate VIP status for you and a guest. Ultimate VIP status includes a Meet & Greet with talent, VIP Deck access, and an invite to and special recognition at the AHF VIP Party on March 22nd. 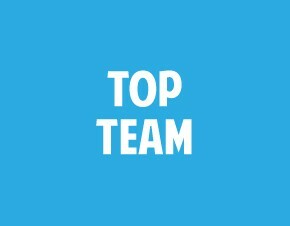 The Top Fundraising Team will get a premium team area on the beach, a banner team sign and Ultimate VIP status for the team captain (plus one guest). Ultimate VIP status includes a Meet & Greet with talent, VIP Deck access, and an invite to and special recognition at the AHF VIP Party on March 22nd. The Largest Team will get a premium team area on the beach, a banner team sign and Ultimate VIP status for the team captain (plus one guest). Ultimate VIP status includes a Meet & Greet with talent, VIP Deck access, and an invite to and special recognition at the AHF VIP Party on March 22nd. 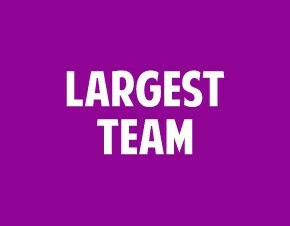 Teams of Ten or more will receive a team sign to carry on the route. 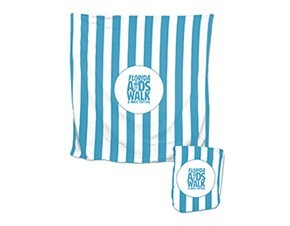 You'll also receive this beach blanket you can take home to keep. You can pick both up day-of the event at the Fundraising Rewards tent. Note: The deadline to qualify as Power Walker, Power Walker Plus, Top Fundraising Team, Largest Team or Top 5 Fundraiser is 11:59 p.m. ET on March 20. The deadline to qualify as a Team of Ten is 12:00 p.m. ET on March 18.